Want to sharpen your job skills, explore a new hobby or take an online class? New fee-based classes offered include computer classes such as Intro to Computers and the Internet, Intro to Excel and PowerPoint and Office Computing, Real Estate Made Real Easy, and other classes such as a School Bus Certification Course and a variety of Arts & Crafts, Cake, Cupcake & Cookie Decorating, and Foreign Language. Fitness and health classes include Yoga, Pilates, Zumba, and Massage. A multitude of career training online programs through Ed2Go are available such as Administrative Dental Assistant, Travel Agent, Optician Certification Training, Event Management and Design, Fitness Business Management, Grant Writing, AutoCAD 3D 2015, Certified Wedding Planner, Human Resource Professional, Non-Profit Management, and Information Technology. Instructor led online courses include Google Analytics, Payroll in QuickBooks, Accounting Fundamentals, Writer’s Workshop, Workplace Computer Skills, Grammar Refresher, Web Page Creation, Excel, Leadership and Business Writing are offered just to name a few. Each year Rowland Adult & Community Education serves more than 5,000 adult students with 19 class locations in the communities of Rowland Heights, La Puente, West Covina, Walnut and Diamond Bar. 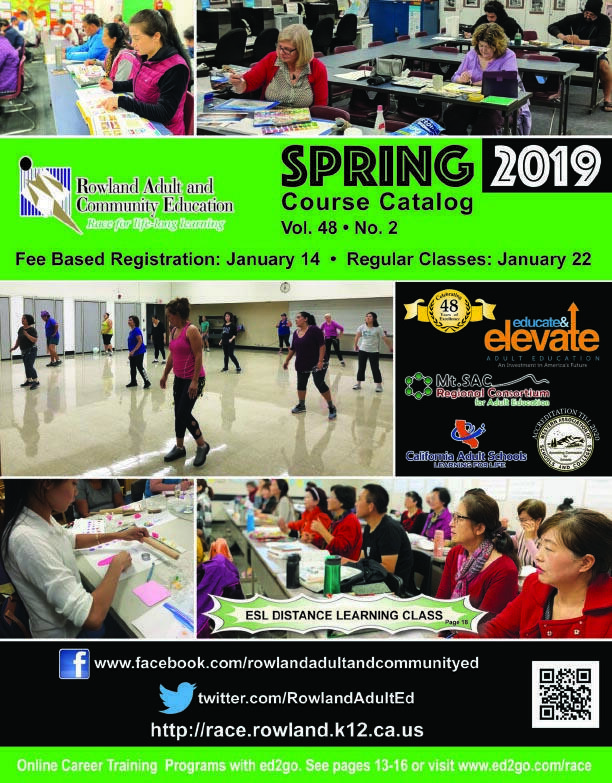 For more information about schedules and classes offered please visit http://race.rowland.k12.ca.us or call (626) 965-5975 between the hours of 8:00 a.m. to 9:00 p.m. Monday – Thursday or 8:00 a.m. – 4:00 p.m. on Friday.